Macro Man has been thinking a bit more about commodities recently, and before addressing the upcoming Fed meeting in another post later this week, he thought it would be useful to follow the line of thought. 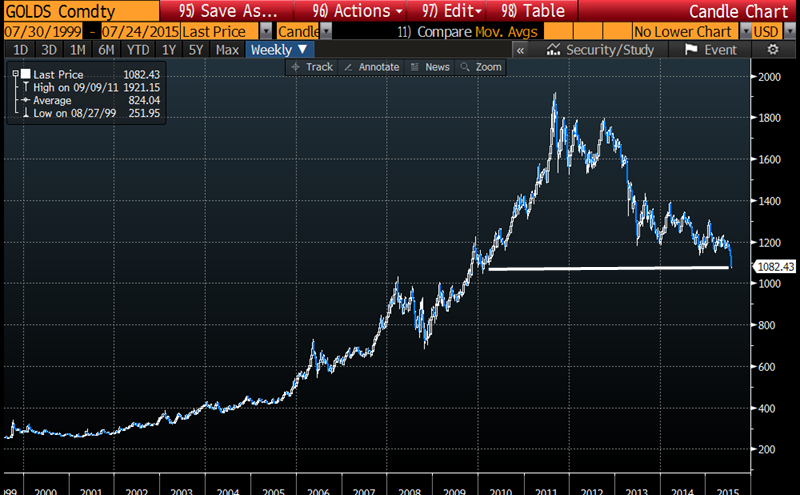 Commodities generally, and gold in particular, have been in the headlines recently given their sharp price decline. Some, indeed many, commenters have expressed the idea that gold is oversold, below its equilibrium level, due for a bounce, etc. While short-term momentum indicators have certainly reached oversold levels (and are exhibiting a bit of positive divergence), Macro Man thought it would be useful to put the recent price decline in a longer-term perspective. Obviously, the supply/demand/storage dynamics for commodities can differ dramatically, and just because one has gone down a lot does not necessarily imply that others should follow suit. Nevertheless, if we look at a broad range of commodities we can still perhaps get a sense of whether or not there are outliers- particularly in the case of gold, where the vast majority of the stuff that is dug up is not "consumed." With the aid of his friend "Raving Irons", your author perused a number of medium-term commodity charts to get a sense of where the current decline is in historical perspective. Other industrial metals look no better. Here's aluminum, which is back to where it was in 2004/05. 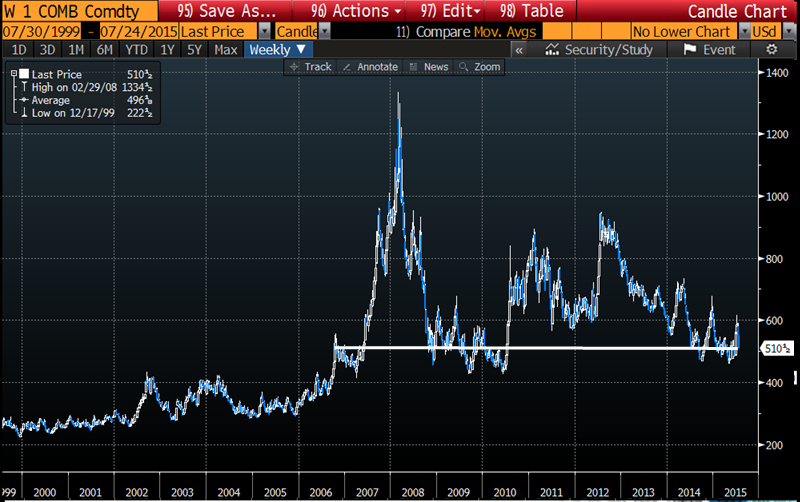 Nickel doesn't look any better, with a its price decline representing a similar journey back in time. OK, we can chalk all of these up to "China" and the "economic cycle", and say that they represent a specific dynamic given that China's been the hegemonic source of demand for a dozen years. How about energy? 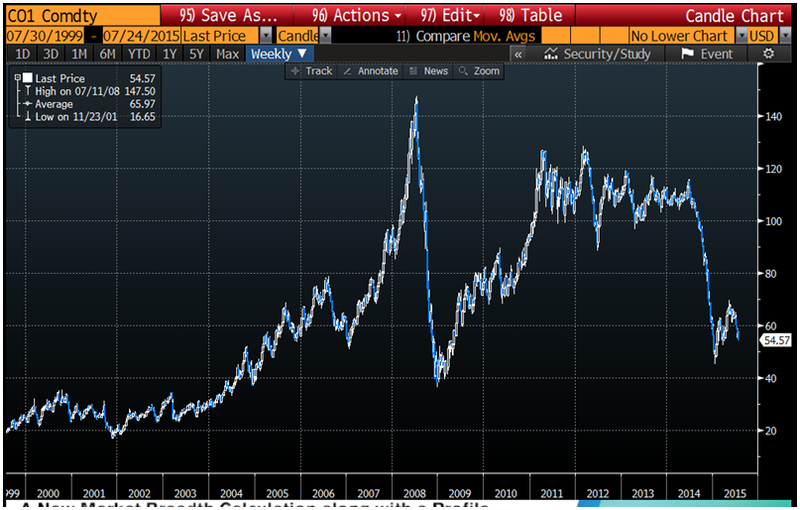 Brent, which strips out the pipeline/refining issues that can distort WTI pricing, is also back to 2006/07 levels. Natural gas, the production of which has benefited from all of the alternative energy exploitation in the US, is back to where it was in 2002. 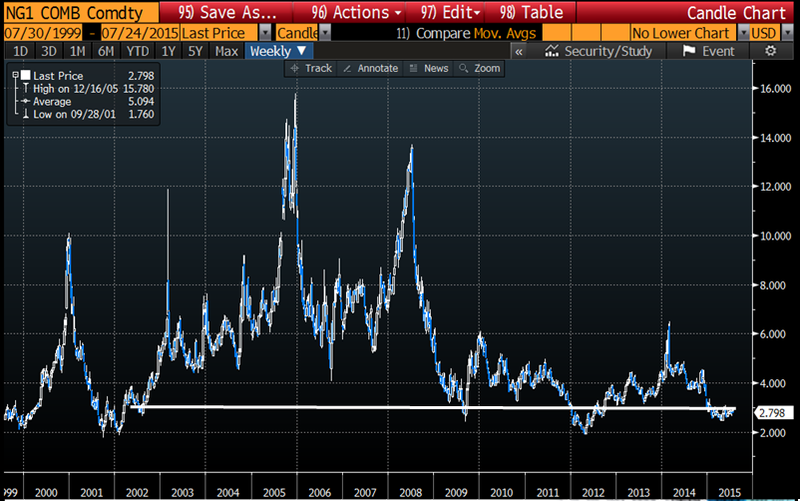 Even wheat, which doesn't require a supercycle of investment to shift production patterns, is where it was in 2006/07. 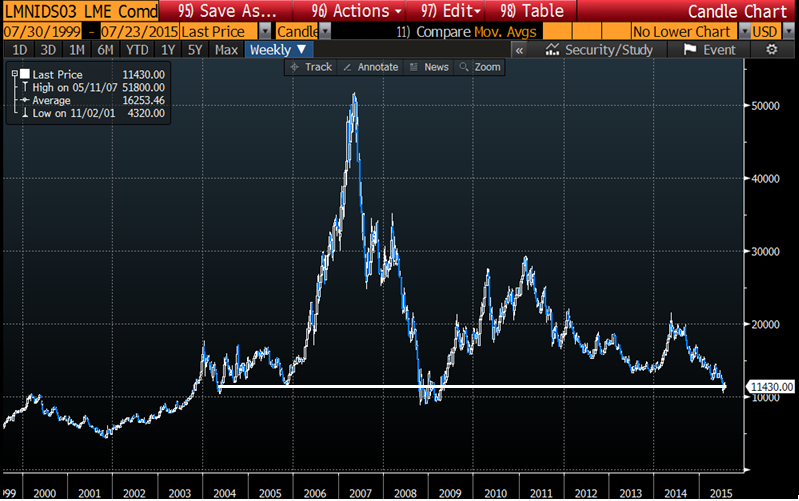 As for gold's monetary chum, silver, its recent shellacking has put it back to 2007/08 levels. And gold? 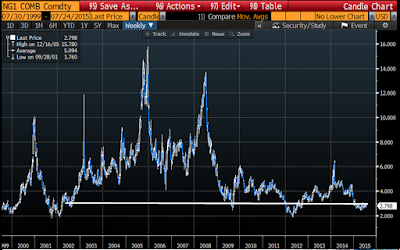 Alone of all the commodities surveyed, it is above its high price before Lehman Brothers went under. 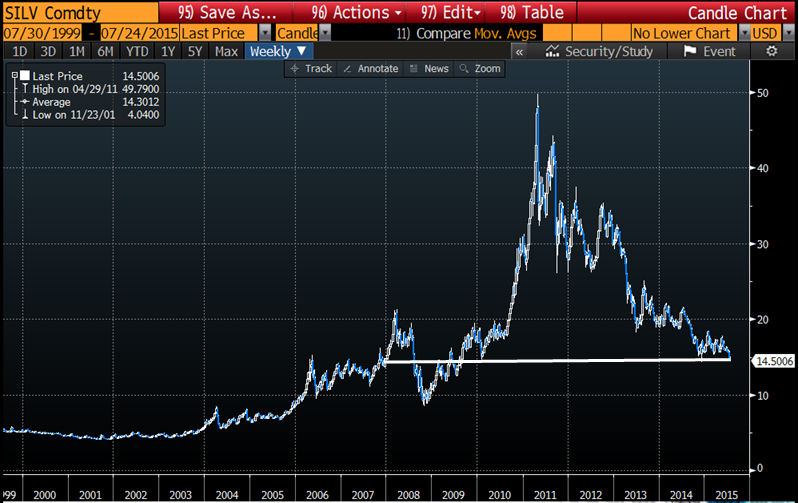 Perhaps the question, therefore, is not why has gold done so badly, but rather why has it done so well? You just gave an idea to ZeroHedge to come up with a cheerleading post about gold doing great amidst commodity collapse, having outperformed everything (except the stocks of course but these are manipulated and it's paper profit anyway and it will collapse) and therefore you should buy and hold forever. @theta - lol. 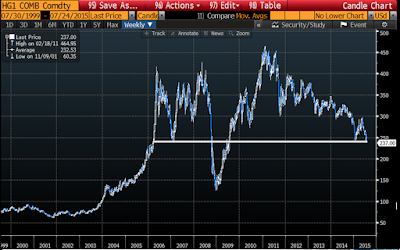 You are however (somewhat) wrong about stocks outperforming gold. Dependent on the starting date of your time series I can prove that gold has outperformed stocks, or stocks outperformed gold, or whatever. I also find rabid goldbugs tedious, but let's not be rabid equities bugs either (even I can't play that game forever). And equities are manipulated - after all, what is easy monetary policy with a view to causing asset price inflation in equities & property, if not manipulation? I do think MM makes an interesting point about Gold's relative lack of demise, however I was also surprised how badly it did in the Greek crisis. The Shanghai Composite Index plunged 8.5 per cent to close at 3725.56, shattering the sense of calm that had fallen over mainland markets last week. At some point, commodities approach their marginal cost of production. They may not stay there very long but they do get there. With the fall in oil (diesel being many mine's biggest input cost) the AISC has gotten progressively lower in $USD terms. There's a a lot of high cost producers who haven't gone to the wall yet so still scope for falls IMO. Commodities can easily stay below their marginal cost of production for a long time. Especially in the case of gold, where current mine supply is almost irrelevant as it is less than 2% of the total worldwide gold stock. Gold is not consumed, it is hoarded. Hoarding/investment demand makes the price and nothing much else. But I still think it's useful to hoard some as a hedge (common definition of a trade gone wrong). Overshooting inflation compared to low expectations could be an issue over the next few years. Just don't get fooled by marginal cost of production floor arguments. 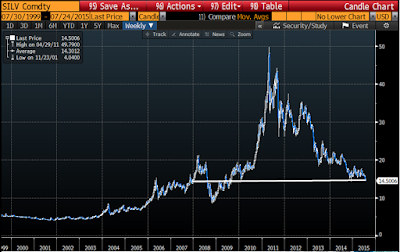 Bet there's a lot of Chinese who wish they'd bought gold instead of stocks. When I think about this point in time we've arrived upon, it seems it gets back to the trying to cure a debt crisis thingy with more debt. A man much older and wiser than I, when we were discussing investments just after the tech bubble, suggested that I not buy techs for the time being as once the bubble burst, his opinion would be that things would need quite some time to settle out. As people debate the inflation vs deflation state of the global economy, it does seem to me that at some point further debt creation will be seen as counterproductive, and deflationary trends should predominate. If that occurs, Au will not be one of the investments of choice. Agreed gnome, marginal cost matters more for aggs and oil where output is constantly used, not for gold where it is mostly hoarded. Over the long term I suspect it will keep pace with asset prices, but for now, we'll look what's happening to the usd vs brazil, canada, auz, Mexico, turkey etc. It's a dollar story, just not a euro story. 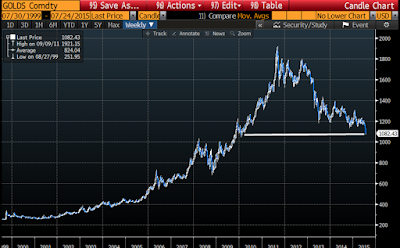 Gold today is like macro trading in heydays of the 80s, all sentiment/technicals with one or two big themes. Goldbugs are gonna get crushed. 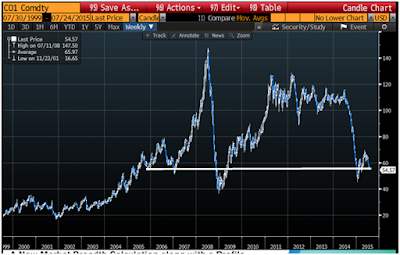 @abee - One could equally say that those long bonds or equities will get crushed. If they do, goldbugs will do well. So it's probably not the whole story, but price-insensitive central banks buying $20bio (500 tons) a year of the shiny yellow stuff, just because they think it'll somehow spite the USA, would probably explain at least part of it. Not gonna editorialise on whether that's a good or bad trade, but these are the same names who couldn't sell enough of it in the 300s back in the late-90s/early-00s - and now they're buying it back a thousand bucks higher. 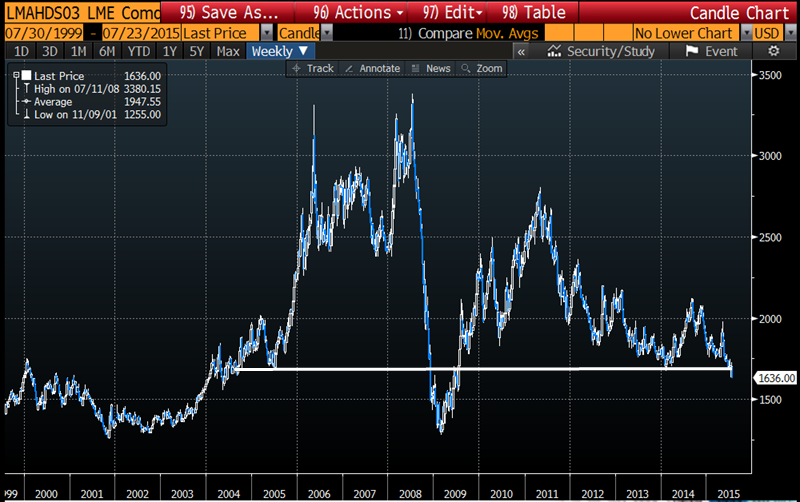 Under gold standard dollar = gold. Inflation means dollar/gold loses value compared to stuff, deflation the opposite, hence you can say that gold rises during deflation. After the gold standard, dollar is not gold, gold moves to the "stuff" category. Inflation means dollar loses value compared to stuff including gold, deflation the opposite, hence gold declines during deflation. This article you linked fails to understand this simple fact. 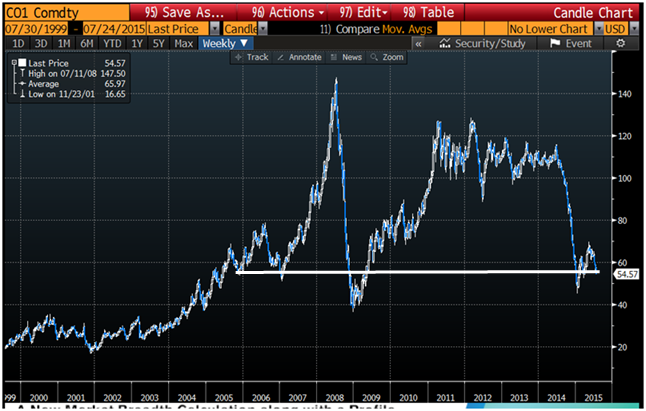 Another sign the commodity super cycle is over. August 8, 2015 at 9:15 AM × This comment has been removed by a blog administrator.